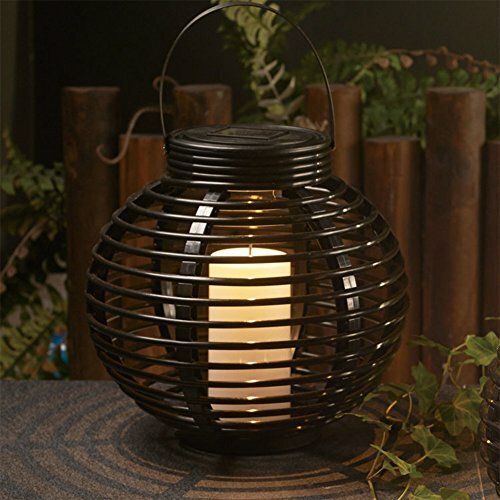 Enrich your outdoor living area and create a warm glowing atmosphere with this solar powered wicker/poly-rattan lights with energy saving warm white LED. Works on solar power. The LED light will burn up to 6 hours when fully charged and at sunrise the light automatically turns off. The rattan lamps are battery operated and have a built in rechargeable battery. Solar energy charges the battery during the day. The Rattan Lanterns are splash proof and suited for outdoor use, but also are a pleasant addition to your indoor living room decoration. Just twist the lid, turn the switch ON and the lanterns automatically switch on as soon as the sun goes down. The candle inside the lantern reflects the warm white LED in the lid. Turn on the switch during the day to automatically charge the solar panel under the sunlight. At night, it will be dark or use something to cover the solar panel. Turn on the switch to automatically discharge and the light will work. If you have any questions about this product by Carole4, contact us by completing and submitting the form below. If you are looking for a specif part number, please include it with your message.